Intown Creative Graphic Design: Vintage car gauge decals - same same but new! Vintage car gauge decals - same same but new! 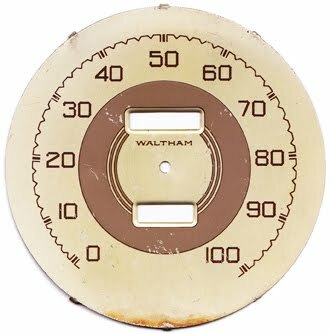 I've been commissioned to create new (but old - vintage looking) car gauge faces for a neighbour who's fixing up his old Ford truck. I believe it's a 1936 or 37 truck. Beautiful machine and he's doing some amazing work on it. But he hasn't been able to find new gauge faceplates that look like the original ones. So I've recreated them for him and will have them printed as decals which he can place right over top. He's very happy with the results. He has talked to many people at car shows and they have either left in the old bedraggled faces or replaced them with new modern ones. Neither of which look right next to the pristine condition of their old cars. this is the original amp faceplate. Notice the dark stain - it's bumpy and sticky and I've been told it's old tobacco! Yuck. this is the original speedometer faceplate....again with the tobacco! new faceplate (the colour isn't exactly what the final product will be). So, if you happen to come across this post and you need new (but vintage) faceplates for your vintage car drop me a line and I can re-create it for you. 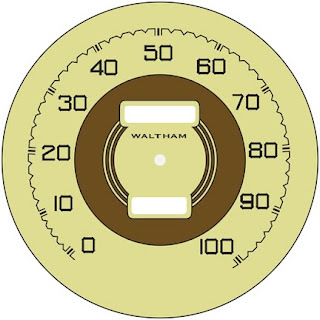 www.intown-creative.com intown@shaw.ca and quote vintage car gauges in the subject line. or, click here to purchase the ones I've already created.